First some business... some quilty inspiration has just been uploaded to my gallery. Go there and look under the Recent Additions. Beautiful quilts!! Now onto more Quilt Market. 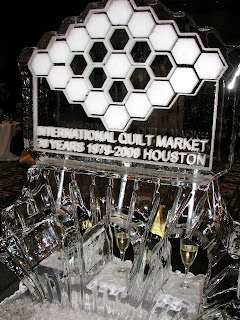 One of the distinct advantages to going to market, is that you meet up with some very cool people. Some quilting celebrities, some friends, some blogging buddies, well you get the idea. First up the lovely Brenda Riddle from Little Acorns. It was nice to see her again, she is just the sweetest and has a great new line of fabric out with Lecien. Go say hello and tell her Jackie sent you! Then Melly and Me. Their booth is always so packed and lively. If you read their blogs you know that they have tons of fun stuff. You can see Melly here laughing with customers. 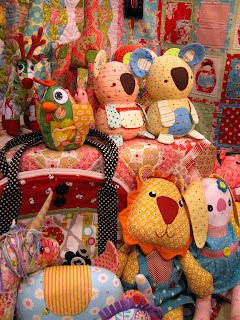 A little sampling of their cute plushes! Here is the very sweet Rosalie. Always fun to speak to and she also has a new line of fabric out with Lecien. Definitely check it out it is just beautiful! I am not sure that these three need any introduction. But here goes, from left to right, Elizabeth of Late Bloomer Quilts, Alex Anderson of The Quilt Show, and Pam Viera-McGinnis of Pam Kitty Morning. They are just too fun!! I always look forward to seeing them. You can see that Alex is holding a prototype of her newest venture, The Quilt Life. A magazine that will begin publication in January, 2010. Congrats to Alex and Ricky! These two people you may not recognize, but are very significant in my life. Dan Purcell and Wendy Anspach. They work at Danemco... Websites For Quilters. Dan is the one who created my website and is currently working on a top secret project with me!! Shhhhh.... Anyway, they are terrific! Pam and I helping Quilt Market celebrate 30 years with a little bubbly. These people you should know, from left to right, Rachel, me, Julie, and Vickie. We kept running into each other all over market. What a fun bunch of gals. Here Kay Capps Cross. 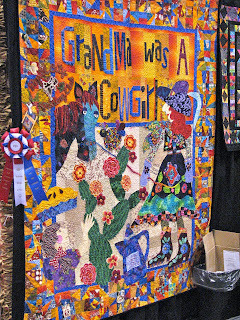 She has written several books on Black and White Quilts that are paper pieced. Here she is signing her newest for me!! The next celebrity has two clues... first the quilt. Then the shoe. Do you know who it is yet? It is Mary Lou Weidman! Here I am with her. She is also signing her newest book for me. It is a fantastic book. Tons of great inspiration and fun. Her is Pam with Eleanor Levie. 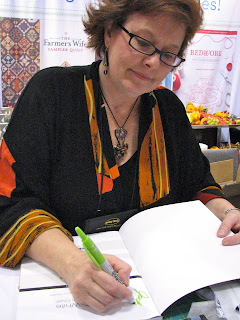 Eleanor has written another new book on Skinny Quilts and Table Runners. This book features tons of wonderful quilters. 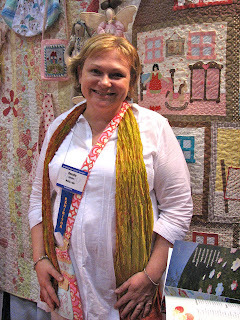 I always enjoy meeting up with Barbara Jones of Quilt Soup. She is such a delight! Barbara also has a new fabric line with Henry Glass, it is absolutely beautiful. She has a new book too, which I was able to snag! And last, but certainly not least, I met up with Vicki Welsh. She is a blogging buddy. If you have never been to her blog, you need to go now! It is called Field Trips in Fiber. Her blog is always jam packed with fun stuff. Not only that, but she hand dyes the most beautiful fabric and sells them on her Etsy Shop. How do I know, well I have made a few purchases. Trust me they are fabulous!! Tell her I said hello! She is super nice and I was so pleased to meet her in person. So if you come back next time to my blog, there may be just a little surprise or two.